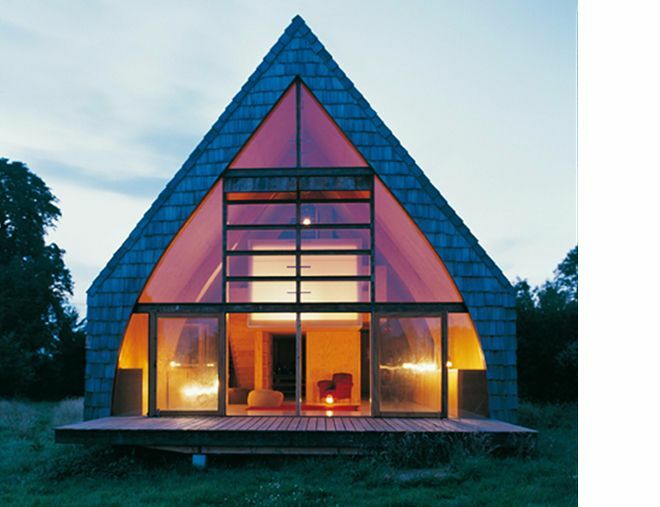 A-frame cabins are the quirky brother of more traditional-style log homes. 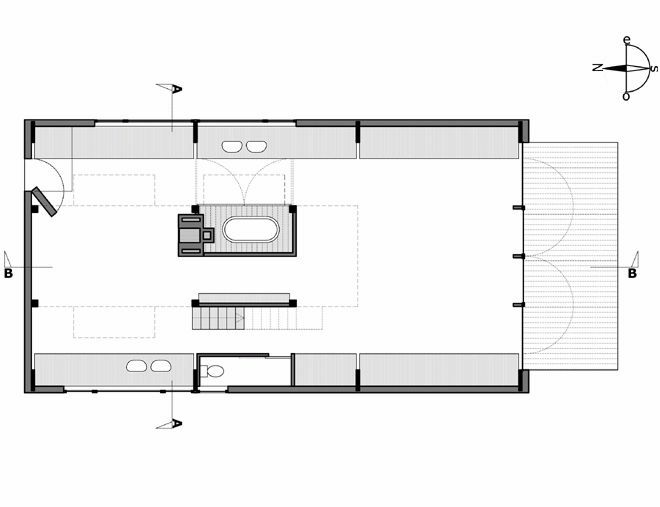 They have character right from the outset, which is mirrored on the inside due to an unusally-shaped floor plan. 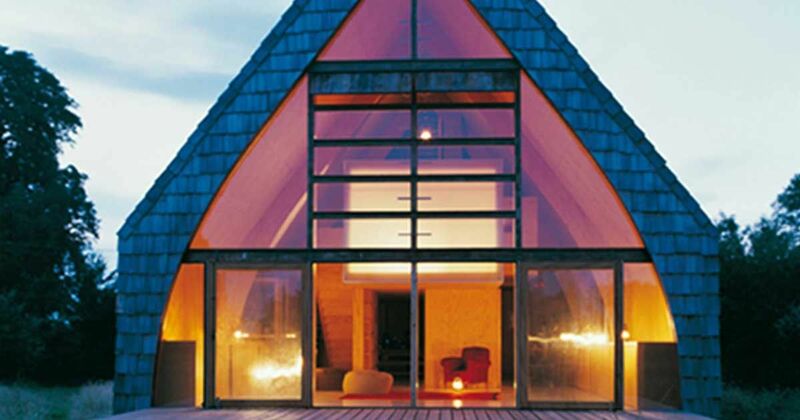 Today we are going to explore a unique A-frame cabin located in Normandy, France. 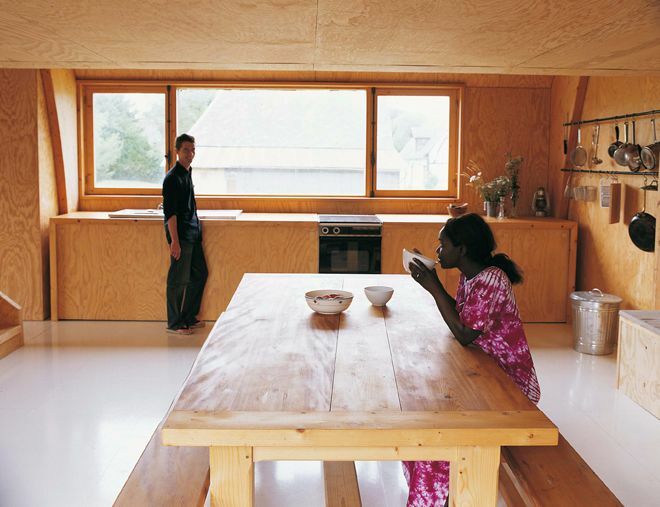 Making use of recycled lumber, architect Jean-Baptiste Barache created his own do-it-yourself rustic countryside retreat. 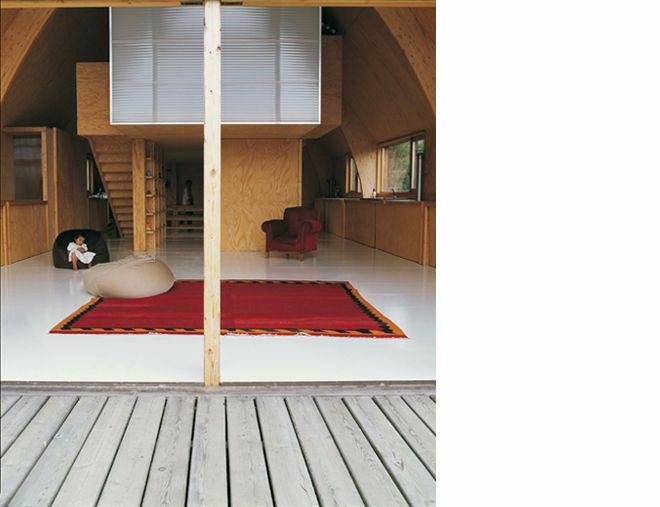 This stunning home is not located among the finery of Paris, it is in the north, deep in the farmlands of rural France. 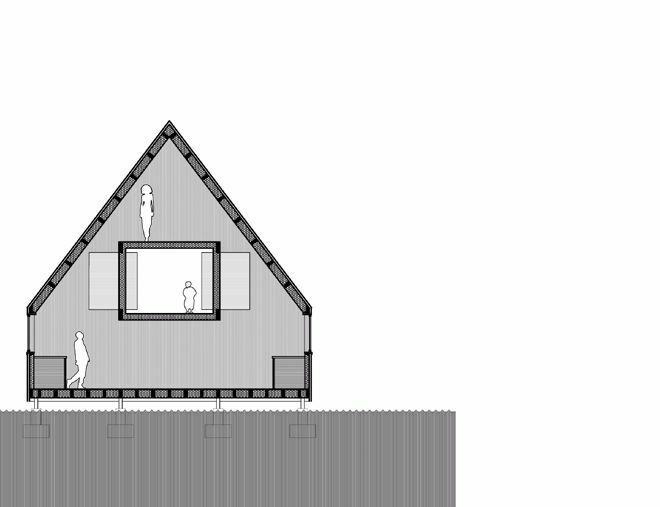 A requirement imposed by the local architectural authority means buildings must have an A-frame construction, however, old techniques meet contemporary design in this 2,000-square-feet home (185.8 square meters). Want to know more? 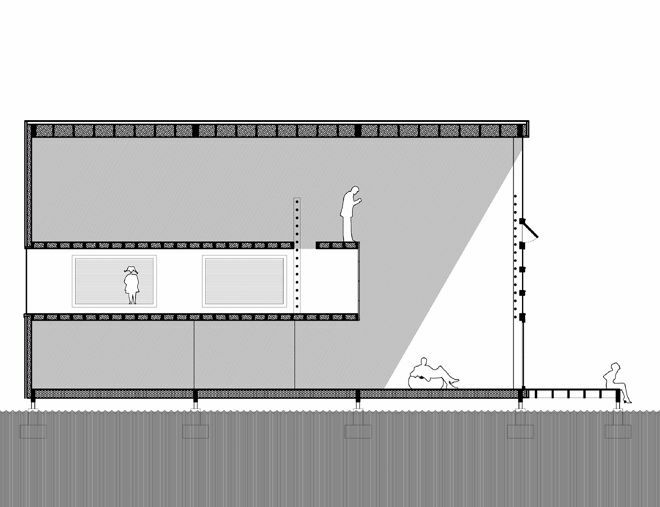 The living room is a voluminous space with 25 feet of air to the roof. The glass facade seamlessly transitions from inside to outside, with a generous deck which looks south to the fields beyond. This solid cabin appears rugged from the outside. It looks like it could easily withstand the elements. 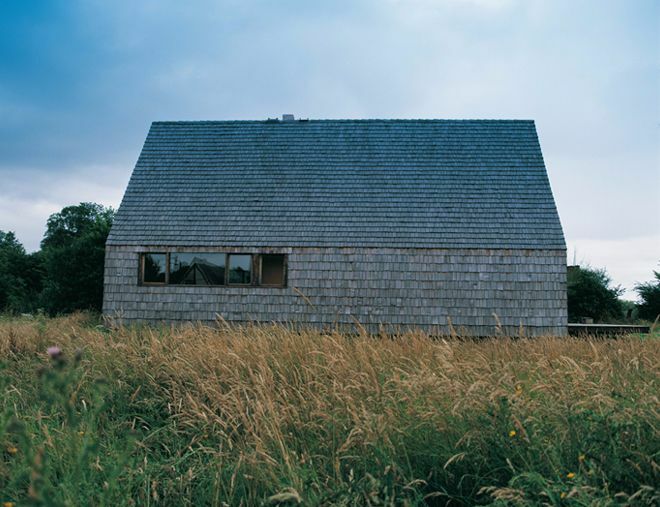 The house sits in a natural, ungroomed field, which adds to the rustic nature of the property. I think the owner is beyond mowing the lawn, better invest in a goat! Looking at the front of the house, we can barely make out the entrance among the red cedar shingling. 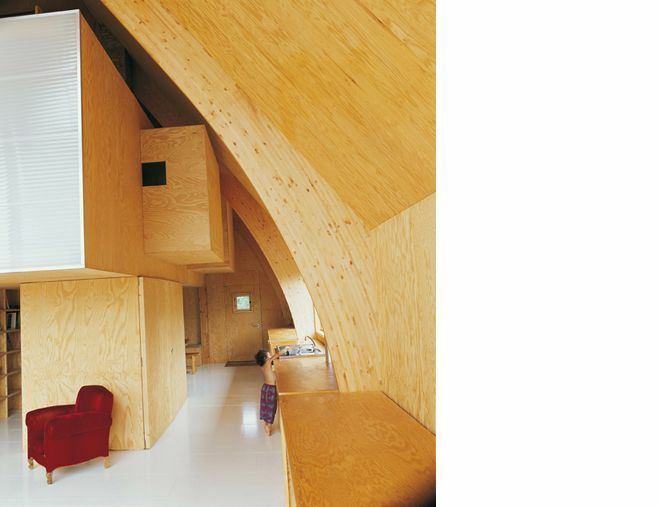 The central pod stands free of the arched ceiling, ensuring the air circulates around the home. 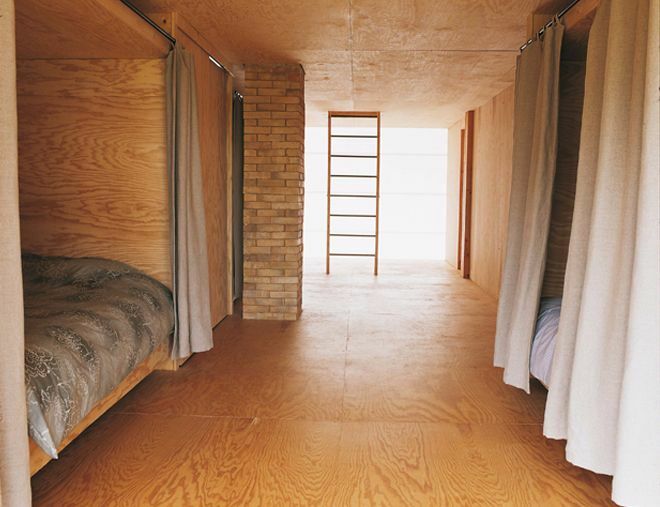 The raised, central section of the house is the sleeping area. The kitchen - also a do-it-yourself job - is a simple space which offers everything required for cooking. Three sliding cupboards house all the kitchen equipment, whilst the cooker is fueled by a gas canister. 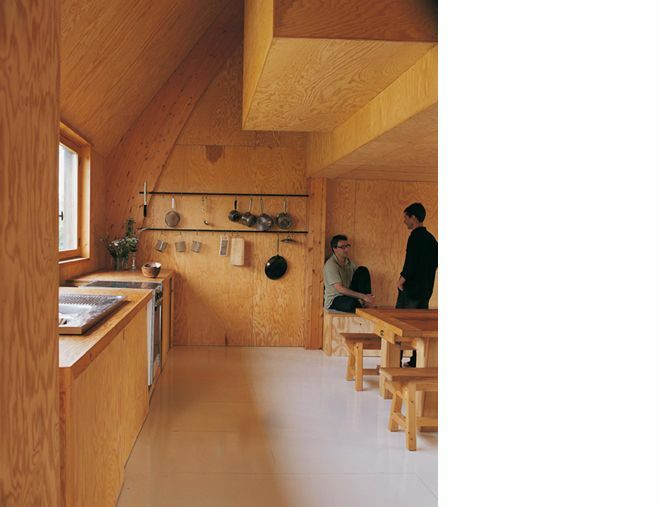 The kitchen houses a homemade wood-burning stove which diffuses heat through the house. 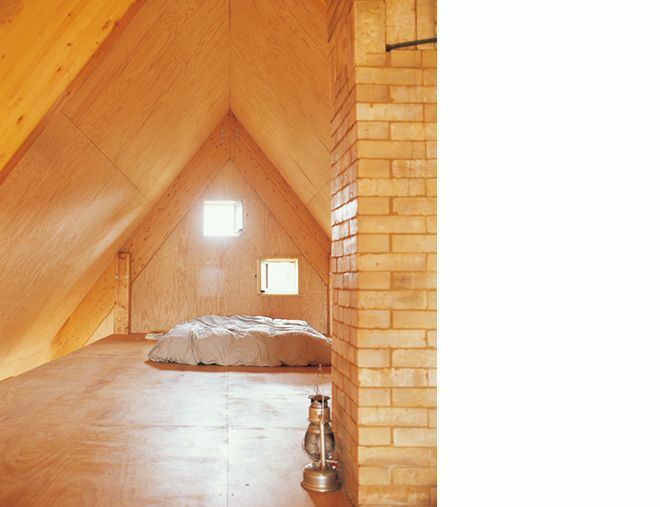 Upstairs is the bedroom: a communal space with three cozy sleeping nooks. The chimney heats the central column of the house from the fire located in the kitchen below. 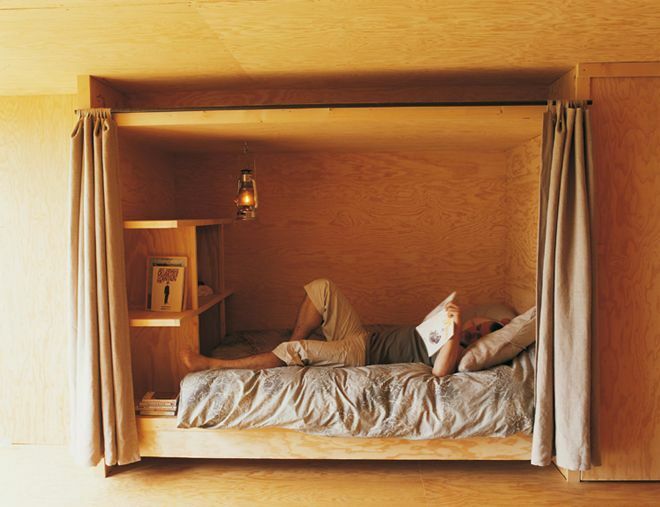 These simplistic compartments - or box-beds - feature ample space for personal belongings. A set of curtains can be drawn to add privacy to your slumber. In the loft space, we find the master bedroom. This minimalist setting is an airy place to sleep, with peak-a-boo windows which will let you know when the new day has arrived. Are you interested in the floor plan? See below. 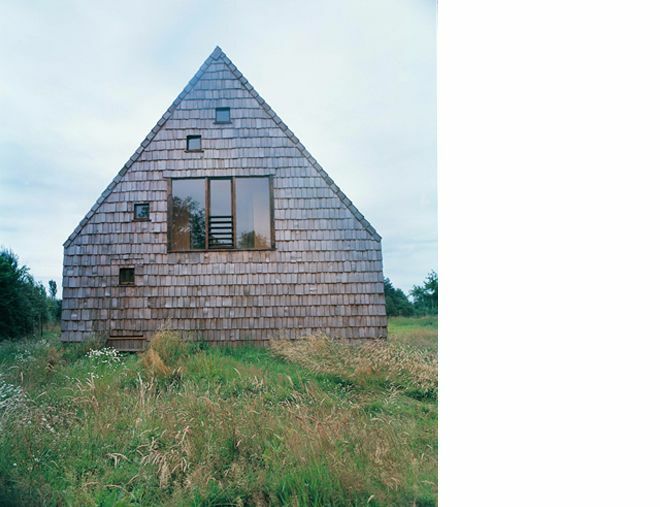 What did you think of this architects rustic retreat? LIKE and SHARE with your friends on Facebook. Just an hour away from the city, this quiet A-frame cabin will give you the privacy you need without requiring hours of driving into the wilderness.